Everyone from startups like Narrative Science to news orgs like the LATimes and the AP are using algorithms to automatically generate news articles, and pretty soon they'll be able to get a bot that can write a clickbait headline. The Stack reports that a Norwegian researcher and blogger by the name of Lars Eidnes has developed a clickbait generator by training a neural network to create sensationalist headlines. As Eidnes explains in his blog post, he taught a recurrent neural network to create clickbait titles by feeding it a couple million headlines (scraped from Buzzfeed, Gawker, Jezebel, Huffington Post, and Upworthy) and asking it to guess the next word in the headline. His bot got good enough that (once it also learned grammar) you could feed it a single word and have it generate multiple headlines. The trick was in the recurrent nature of RNNs; each time the bot added a word to a headline, the new headline was fed back in to the bot as input, eventually resulting in a complete headline. In addition to creating the bot, Eidnes has created a site as a proof of concept. 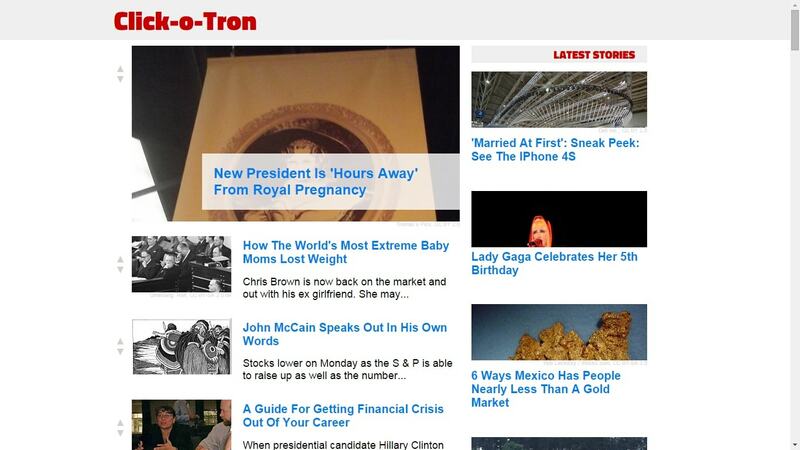 Clickotron is perhaps the first "news" site where everything is written by a bot. It's updated every 20 minutes with artificially-created news stories. Starting with the bot-generated title, the site finds a matching image by searching the Wikimedia API with the headline text, and selecting pictures that have the appropriate CC license. The headlines are often nonsensical and the text is worse, but as a proof of concept it does work (mostly), and I think the complete lack of value may have been one of Eidnes goals. As he explains at the end of his blog post: “In total, this gives us an infinite source of useless journalism, available at no cost. If I remember correctly from economics class, this should drive the market value of useless journalism down to zero, forcing other producers of useless journalism to produce something else." Joking aside, Eidnes has shown us that it's possible to teach a bot to write particular types of headlines. And since many news sites have their own pattern for headlines, it should be possible to adapt the idea Eidnes developed for his clickbait bot and use them to suggest headlines for other less evil purposes. That is neat that a program can write decent clickbait headlines. However, the articles and pictures don’t make sense or match the headline. I believe a bot could write a headline that would shock me, but can it make my jaw drop? Either way, my neighborhood is rattled by this development.